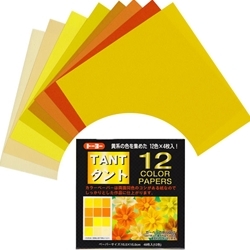 Yellow Tant Origami Paper comes in 12 different color shades with a crepe-like texture. There are 2 sizes to choose from. The 3" pack contains 96 sheets and the 6" pack has 48 sheets. Tant Origami Paper Pack - YELLOWS - 3" x 3"
Tant Origami Paper Pack - YELLOWS - 6" x 6"
Bright hues jump off these Tant Origami Papers. Each sheet provides a stiff origami paper with a crepe-like texture. The Origami Tant Paper holds a crease well and responds to wet-folding making it a perfect paper for folding projects with sharp edges such as geometric shapes and modular origami. Each pack of Tant Origami Paper contains 12 different color shades. The Tant Papers are available in the popular 3" and 6" size packages. The 3" size package contains 96 sheets of paper and the 6" size package contains 48 sheets of Tant Origami Paper. The Yellow Tant Origami Paper Pack includes free instructions on how to fold a bouquet of sunflowers. The Tant Paper Pack is also available in Blues, Greens and Reds.